This could be you. Excited about becoming a partner in a mid-sized consulting firm. A great change from working with the Big 4. Eager to communicate some amazing solutions to your client. Then suddenly reality hits. Your presentation deck is a mess and your first big meeting deadline has approached. Your brain is about to POP with frustration as you quickly try to align tables and text into your new firm's company style guide. As an ex-McKinsey consultant now working for a mid-sized consulting firm, presentation graphic assistance is probably what you miss the most. You yearn for the Yesterday when you could effortlessly upload a deck to your Virtual Graphic Assistant at McKinsey for a quick formatting and polish. Today, you are lost without that amazing team. Stress is an understatement. Just reach out to presentation service providers and graphic production firms supporting global consultants with overnight turnaround. 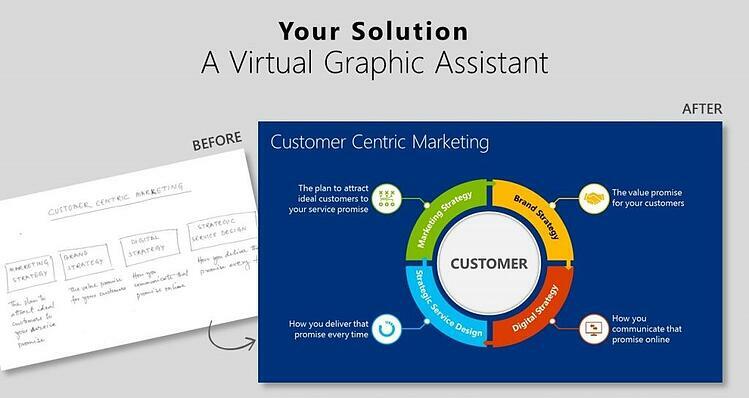 Graphic support partners delivering the same quality that you experienced “in-house” with your Virtual Graphic Assistant (VGA) at one of the Big 4 management consulting firms. A PowerPoint graphic design company providing this type of service will know exactly what you mean when you say, "I need my deck fit and finished". They know what type of support a consultant needs. At a mid-sized consulting firm, most often a freelancer for graphic assistance is considered as a faster and cost effective solution. It is indeed a quick win. But have you thought deeper? Your "one person freelancer" team may not be available for your random last minute presentation polishing requests. And there is the bigger issue of confidentiality and data security. Download this Quick Guide to Help you Work Through a Checklist in Selecting an Outsource Partner. Your need is clear. You are beginning to see there is a good solution at hand. Most presentation graphic assistance firms operate virtually, are faster and most important, have a clear process to ensure confidentiality of your decks. Reaching out to them is probably the first step you should take after a career shift from the Big 4 to mid-sized firms.